It looks like Dwayne Johnson may have managed to break the video game movie curse with Rampage. The movie held its premiere in Los Angeles recently and, based on the first wave of social media reactions, it sounds like Rampage is actually a good video game movie, which is something we haven't definitively had yet. Dwayne Johnson is one of the biggest stars in the world and his charisma combined with some big monsters, big budget action and a B-movie tone appear to have made for a winning combination. Hollywood has been trying to crack the code on video game movies since the 90s, starting with the disastrous Super Mario Bros. movie. Rampage is adapting the 80s arcade game of the same name, which simply involves giant monsters destroying cities. Apparently, taking a simple premise like that and just trying to make it theatrical has worked. Eric Eisenberg of CinemaBlend promises this is the movie that breaks the video game curse. Here's what he had to say. "Excited to say that @rampagethemovie is the film that breaks the video game movie curse. It's super silly, but also a ton of fun, particularly driven by the charisma of Dwayne Johnson & Jeffrey Dean Morgan (who need to start making a lot more movies together)." Dwayne Johnson reteams with director Brad Peyton for Rampage. The two previously collaborated on Journey 2: The Mysterious Island and San Andreas. With this movie, they're sort of throwing elements from both of those movies into a mixer, as this is essentially a disaster movie, but the disaster is giant monsters. Assuming audience members are comfortable with a big, dumb but supposedly fun monster movie, Rampage may do the trick. Scott Menzel of We Live Entertainment had this to say, praising it as a guilty pleasure in the best way. "Rampage is the ultimate guilty pleasure. Brad Peyton has created a big budget B movie & Dwayne Johnson delivers his most outrageous performance to date. #Rampage is the ultimate monster movie and is non-stop campy fun. Did I mention that Dwayne Johnson fights a giant flying wolf?" In addition to Dwayne Johnson, the movie also stars Jeffrey Dean Morgan, Joe Manganiello, Malin Akerman, Jack Lacy and Naomie Harris. 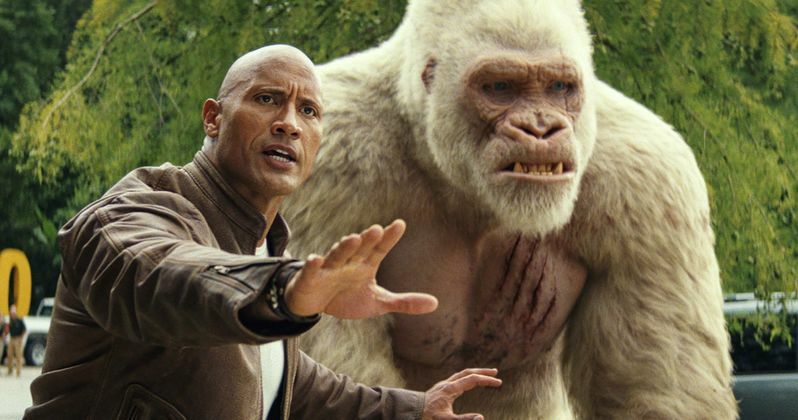 Originally, Rampage was supposed to open on April 20, but when Marvel moved up Avengers: Infinity War to April 27, Warner Bros. decided it would be best to shift the monster movie up a week to April 13. That will give it at least a couple of weeks before Thanos comes in to dominate the box office. Jim the Movie Man took to Twitter following the premiere to suggest that Rampage may even be worthy of an Oscar. "Will #Rampage be eligible for the #Oscars? @TheRock ? Asking for a friend..."
Undoubtedly, there's no way Rampage will be on anyone's Oscar ballot next year. However, it is good to hear such positivity for a video game movie of any kind. It may not be a cinematic masterpiece, but the fact that it looks like The Rock and Brad Peyton got it right is important and could help lay out a roadmap for other video game adaptations in the future. The question is, can Rampage deliver at the box office as well? Given how well Jumanji: Welcome to the Jungle did, there's no reason to think it can't. Warner Bros. is certainly hoping it will. Be sure to check out more of the Twitter reactions for yourself below.